When the cold winter ravages the south of the country, the temperatures drop dramatically. 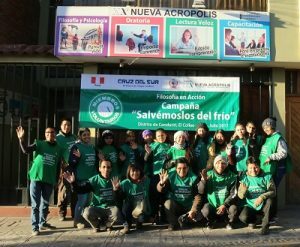 In the province of Puno, the cold reaches -20 ° and causes serious damage to the inhabitants of the most remote areas affecting crops and the health of children and the elderly, who are prone to suffer from respiratory diseases. Every year we reach out with humanitarian and social aid those who need it most. 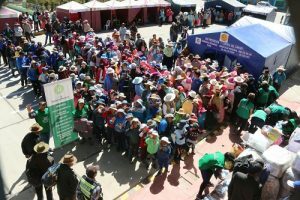 On this occasion, we reached the district of Conduriri, located at 4,000 meters above sea level, where more than 600 people from the communities of San Juan de Chiutiri, Providencia, Sales Grande, Sales Chico, Circapampa, Conduriri, Chapi , Chilligua, Huaripujo, Calasaya, San Juan Capilla, Phorque, San Jose, Untave Grande, Untave Chico, Huanacamaya, received donations. 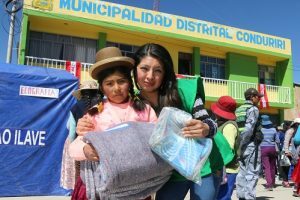 New Acropolis also benefited from the participation of the authorities of these communities, and the donations consisted of more than 300 blankets, 225 pairs of booties for children, 100 woven “chullos” and multiple outerwear items distributed among all attendees. In addition, medical assistance was provided and a children’s theater performance entitled “The shoemaker and the goblins” was presented. Sergio Paredes Cuba, director of the Puno branch :”We have done this work for ten years and we have visited places both in the north and south of the region, such as Punta Perdida, Mazocruz, Ituata, Azaroma, among others, benefiting in each campaign around 600 people who live in vulnerability in these times of cold weather”. Celebrations in Portugal for the 60th Anniversary of New Acropolis!